The above entry in last years Essay Contest was written by Sue Betko of Hillstown Grange #87. It received an Honorable Mention from the Judges. Grange Sunday is fast approaching. Make you plans to attend now. It is June 8th at Good Will Grange Hall in Glastonbury. State Chaplain Amy Whitcomb will be preparing the church service for 11:00 followed by lunch. Our Talent and “A Number” contests begin at 1:00 p.m. sharp. Make sure your Grange and your Pomona are represented. Our Talent winner will be representing the State at the Regional Talent contest to be held at the Northeast Lecturers Conference in Maine in August and will perform at National Grange in Cromwell in November. It is time to get excited about the Grange. Lecturers all across our State are presenting programs that are both educational and entertaining. Grab your friends and show them just what the Grange is all about. 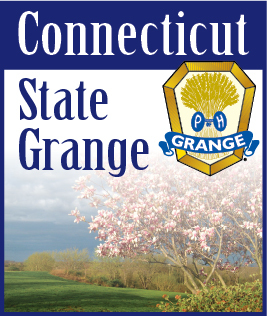 Grange Sunday would be a perfect time to invite them to see our organization in action. And, don’t forget to bring some membership applications along. Looking back at the essay at the top of this article – “the Grange is still the place to meet the nicest people”.